We had a potluck for small group this weekend and one of our hosts is gluten intolerant. I wanted to make sure she had a dessert she could eat. (She serves us so many good treats week after week.) I had a recipe for Deep Dark Chocolate Cookies on my Eats and Treats board on Pinterest, that happened to be gluten-free so I thought I would give it a try. Photo is from original recipe. Notes: I used semi-sweet chips and cut out a half cup of powdered sugar. I would still cut out that powdered sugar, but use the bittersweet chips the recipe calls for. I forgot the salt until the dough was all mixed, so I just added it then. I have a tendency to do that, I’m not sure why. Last time I made chocolate chip cookies I forgot the salt, so I just ended up salting the top of them. It was surprisingly delicious. Really, really butter your pans or use parchment paper. The bottom of the cookies did not want to leave their new best friend, the pan. Don’t use paper towels instead of a real cooling rack. It works for normal cookies, but with these cookies you might get a little more fiber than you planned. Don’t leave your windows open as the cookies cool. When the wind blows in, the powdered sugar on the outside will blow all over your kitchen or dining room. I was expecting them to be softer and more fudgy, but they were really crispy on the outside and gooey on the inside. I probably won’t make these again, but everyone else seemed to like them and more than one person asked me for the recipe. 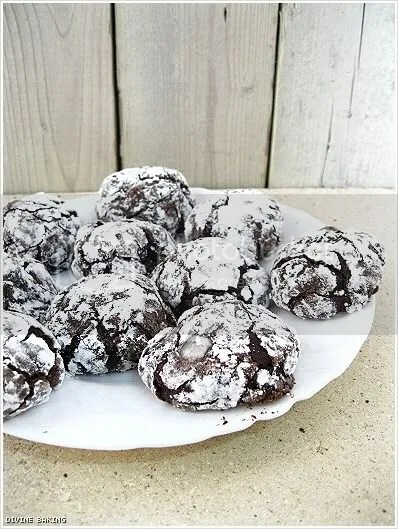 So, in summary…generously grease the pan, don’t eat paper towels, close the windows or you will have a sugary mess and don’t expect these to turn out like chocolate crinkles, even though that is exactly what the look like.